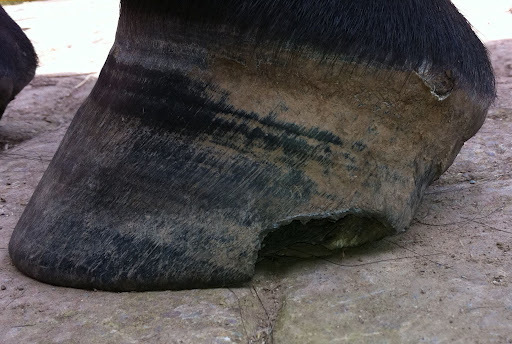 As expected, a chunk of Aero’s hoof wall sheared off, just the day before Anja the AEP practitioner was due to call. 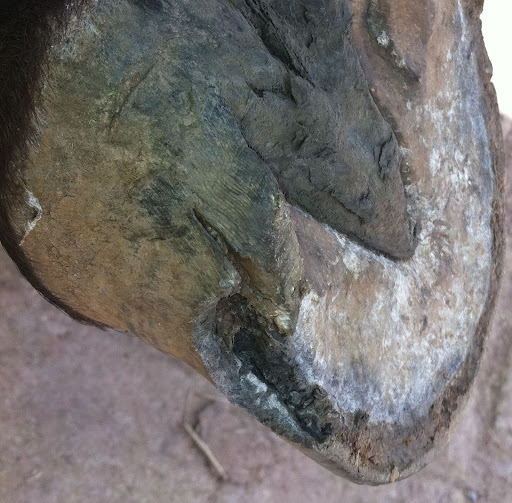 I cleaned it and soaked his foot in a bucket of Epsom salts, but it is quite badly damaged and you can see that the weakness continues upwards through the hoof near the heel. The good news, though, is that any pus should be able to drain away quite easily now, but the bad news is that being so open, it’s very susceptible to re-infection. When Anja called the next day, she tidied up the break, cleaned the opening and stuffed it with Hoof Stuff, which is made from honey, Zinc Oxide and cotton wool. It adheres to the cavity, aids healing, allows drainage and acts as a barrier while the hole is growing out. Hope it works! 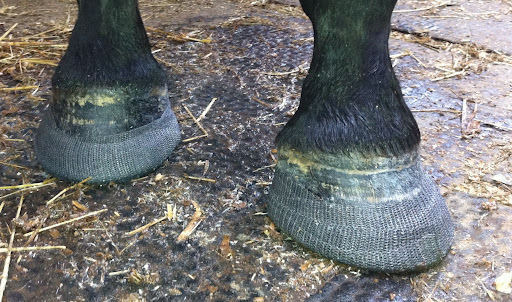 Aero was clearly still very sore on this foot, and our conclusion was that the sole is having to carry too much weight because there is no hoof wall at that point. 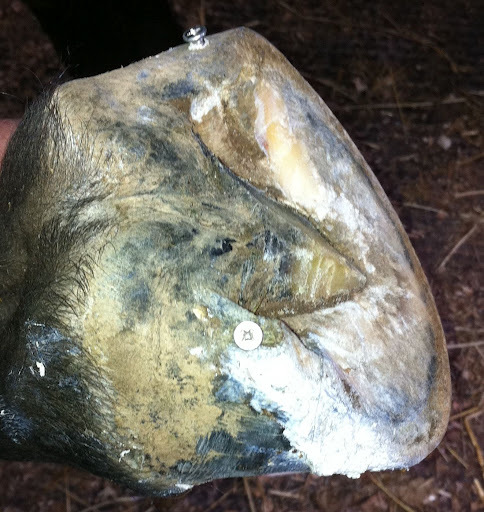 She felt that putting him back in PHW wraps would benefit him and help to support the weakened hoof wall, while at the same time allowing normal circulation to continue, allowing the hoof to breathe and enabling me to soak it or Clean Trax it as necessary. 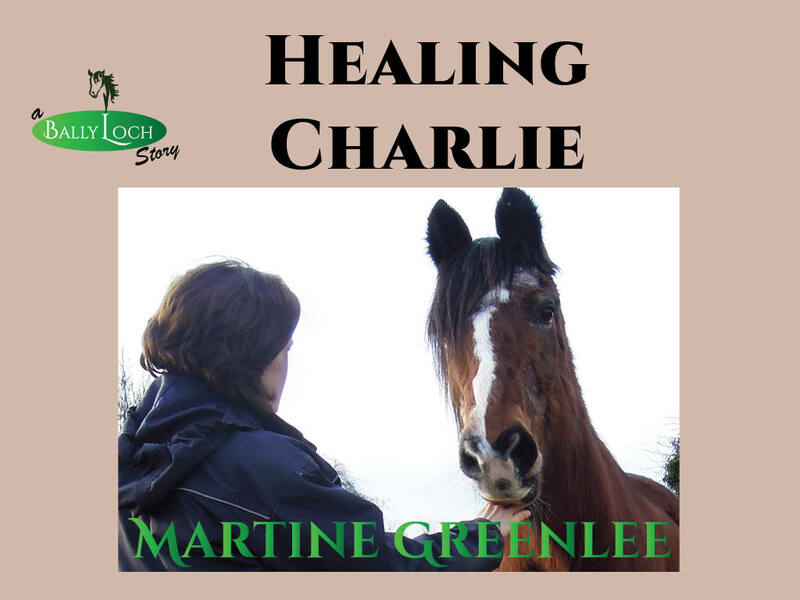 Initially, he has been very sore, not quite on three legs but not far off it. There is still significant heat in this foot, centred at the heel. I am planning to Clean Trax it just as soon as I get my hands on a bottle (tomorrow hopefully) because I suspect that the solution I used last week was gone off – it’s supposed to be kept in the fridge, but that bottle had travelled around France with us for four weeks. I’ve also been reading up about abscesses on various forums. The current thinking really seems to be “let it drain by itself” and to use Epsom Salts or Cider Vinegar (a new one on me) in a solution to soak the foot. Having already spent a week soaking his foot in Epsom Salts, I think I will try the Cider Vinegar this time. Any other suggestions will be gratefully received. It is so hard to see him in pain all the time, he’s a sweet boy and he doesn’t deserve this. Today his sore foot seemed the same temperature as the other three and he looked ok in three strides of trot. I'm hopeful that he's turned a corner. I will have a proper look tomorrow, I'm afraid to jinx him by checking him out too early. Jackson is an abscess machine. I wish I had some advice but I just do as you are — soaking, etc. I'm not a fan of summer in general, but with Jackson it is definitely a happy time. Hard dry ground means we get a break from the winter cycle of soaking, draining and lameness. Poor Aero. I hope he feels better soon.It is kind of strange that he is still sore, even though the abscess was released at the coronet. Maybe he is working on another one?I must admit that the screws freak me out!